Oooh wow, this a keeper Honeybunches! I stumbled across the combo while using up leftovers a few weeks back, and having refined it a smidge since, it's safe to say I'm feeling rather confident about it. 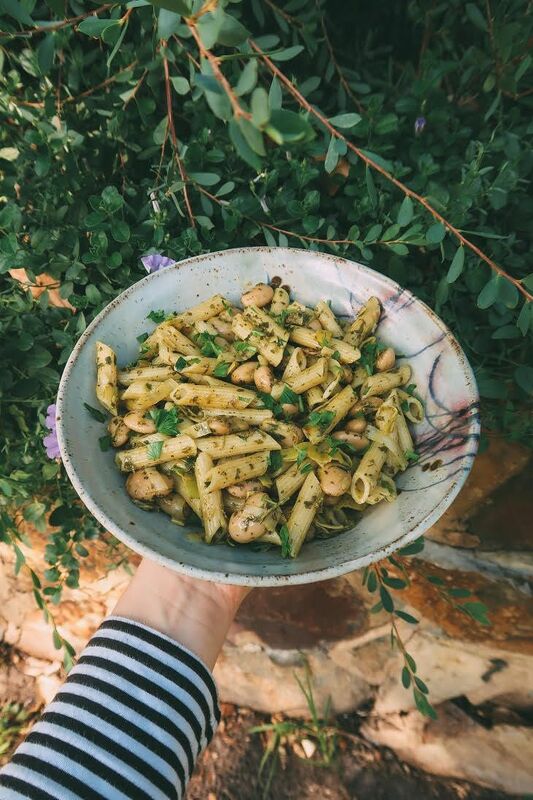 If you're a fan of pesto pasta, or specifically this recipe which draws in positive reviews from those who try it, then I bet you this will be totally up your street as well. Salsa verde is just heavenly, and full of flavour in the most wonderful way. Yes, the measurements are a little loose, but I've made it multiple times following them (or close enough) a number of times now and bloomin' heck all you need is love HB's. No seriously, you can't go wrong. And beans in pasta - sounds basic and super "starchy" but the butter beans are almost creamy, it's wonderful. So don't knock it until you try it! Hope you enjoy this one Honeybunches!! Start by making your salsa verde by blending all the ingredients listed under the Salsa Verde section of the ingredients together in a food processor or blender. The texture you see in the photo is from a food processor so if you'd like a smoother consistency, use a blender. Scrape down the sides so everything is processed/blended well and set aside until needed. Pop your pasta onto boil according to the packet instructions. When al dente, drain & set aside until needed. Sauté your onion and garlic in a little olive oil until the leek is soft (watch it as it can burn easily) and a touch golden, yet still a little lively in colour. Add the drained beans, stir to remove any moisture on them and to warm through. Add all the salsa verde, and stir to coat the leeks and beans. Tip in the drained pasta and stir everything to combine. Might look like the pasta: verde ratio is out, but keep mixing and you'll see there is enough if you used the 350g of pasta mentioned. Serve & enjoy! A fab variation on this would be to do it with some battered tofu as well, delish! In a large bowl, add the brown rice flour, chickpea flour, garlic powder and salt & pepper, and whisk until combined. Make a well in the centre and add the plant milk and water (1/2 cup + 1 tbsp amount), whisking from the centre outwards until smooth. In another bowl, tip in the breadcrumbs and while your at it, grab a baking tray. Take a cauli floret, and coat thoroughly in the batter, tapping to remove the excess, toss in the crumbs and place on the tray. Repeat to use up all the cauliflower. Drizzle a little olive oil over the cauliflower and bake in the pre-heated oven for 15 minutes. Flip & drizzle a little more oil on the floret, then bake for 10 minutes more in the oven. Meanwhile, make your sauce by adding the brown rice syrup, vinegar, tamari, tomato sauce and garlic to a small sauce pan. Whisk to combine and bring to a gentle simmer. Whisk the cornflour and 2 tbsp of water together in a small bowl and when the sauce is bubbling, add it to the saucepan and whisk, until the sauce thickens. It will only take a minute or two. Turn off the heat & set aside until ready to serve. 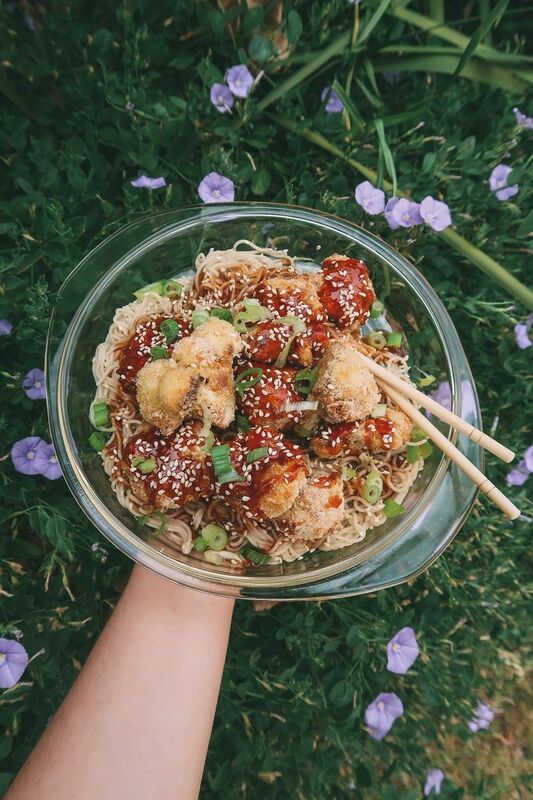 Cook your noodles according to packet instructions as well, then when done, drain and to prevent them from sticking together, drizzle a little sesame oil over them & toss with a fork. These are SO great! They are the perfect answer to the perhaps familiar scenario of having a vegan dinner party (or 3 course vegan meal of some kind) and wondering what the heck you are going to make as the main component. You've got all ya' salads and side dishes worked out, but you were kind of hoping to have something on everyone's plate that screamed MAIN, so that no one was feeling like they were eating a 'something's missing' kind of lunch/dinner etc. 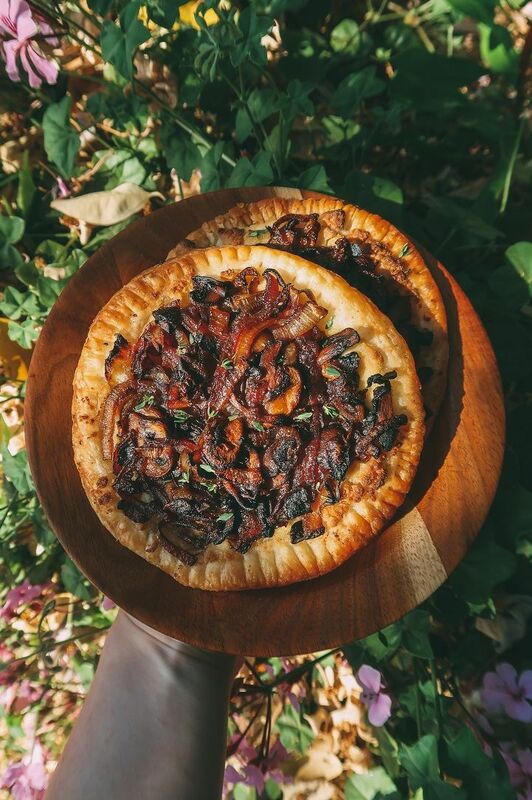 The nut cheese which lays on top of the flaky pastry is heaven in itself and topped with the onions & mushrooms - I think you'll find this quite a wonderfully filling little recipe to have up your sleave. Enjoy honeybunches! Pre-heat your oven to 200C fan forced. Take a large frying pan and add a drizzle of olive oil. Add the onions, mushrooms and garlic and sauté without touching them too much for 10 or so minutes. Or until everything is reduced & softened, the onions are starting to caramelise and golden. Add the vinegar and maple syrup, stirring to lift off the flavour from the bottom of the pan and help the onions to caramelise. Add the knob of butter and let bubble and melt, stirring once again to help the onions caramelise and the flavour to lift off from the bottom of the pan. Once at a stage that you would happily eat (or a bit before as it's going into the oven), turn off the heat, add the thyme, salt & pepper and stir once more. Line a baking tray with baking paper and decide on your desired shape of your tartlets. 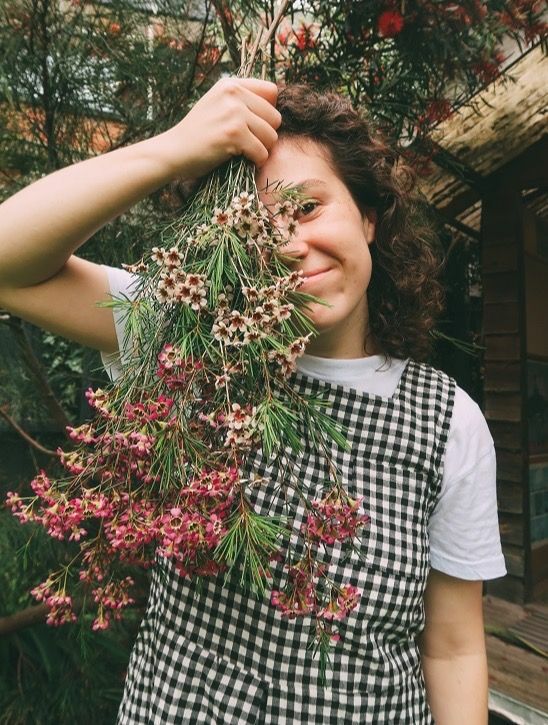 A bowl can help get an appropriate size for a circle, but whatever shape it is - just be sure to cut out two the same and stack one on top of one another for optimum thickness and structural support. Cover the base of your tartlets with the nut cheese, using your fingers if necessary, to smoosh out a moderate layer. Leave a 1-2cm rim around all edges of your tart. Divide the onion & mushroom mixture amongst the tarts, then use a fork to press down around the rim of your tart. Brush the rim with some olive oil and then bake in the pre-heated oven for 20-25 minutes, or until golden brown. Enjoy! A classic. Not much to say or explain here, other than emphasise that these are just as fabulous as the original, which is pretty mind-bogglingly wonderful considering they're vegan AND gluten-free. This pastry is pretty wonderful too, achieved through gluten flour and almond meal, as well as some lemon zest which gives it a welcome subtle 'pop'! Overall the result should have everyone fooled if need be hehe, and be easy enough to make an appearance at every Christmas. In a food processor (or large bowl), add the first six ingredients (down to and including the salt) and pulse to combine. Alternatively mix in the bowl until combined using a spoon. Add the vegan butter & coconut oil and pulse again until the mixture is combined/resembles sand. Alternately use a fork (if doing this in a bowl) and mash/break up the butter & oil until it is thoroughly combined and evenly distributed). Add a splash of cold water to the food processor/bowl and pulse/mix again until it comes together. Add more water if needed. Fashion the pastry into a smooth ball with your hands and flatten into a disk. Wrap in plastic wrap and place in the fridge to chill for 30 minutes minimum. When you are ready to make your mince pies, take your pastry out of the fridge & pre-heat your oven to 180C. Ensure it's on the slow setting as opposed to fan-forced if possible. Flour a surface and roll out your pastry so it is about a 1/4 inch thick (approx. 3/4 centimetre). Cut out disks using a glass/cookie or scone cutter and place in greased (with vegan butter or some type of oil) minced pie trays (or you could use muffin tins). 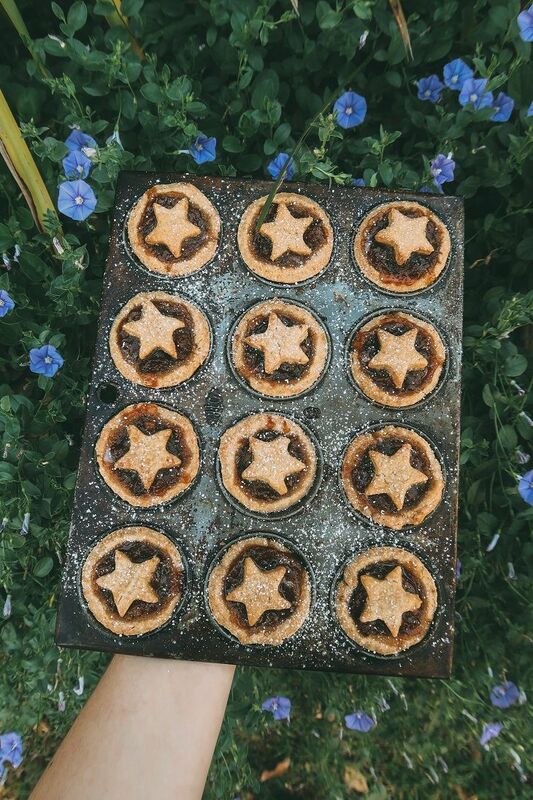 Place a heaped tsp of the fruit mince in each and then top with a pasty lid or cut out star. You do you honeybunches! Having cauliflower cheese growing up was looked forward to with much anticipation & the odd bit of drool. 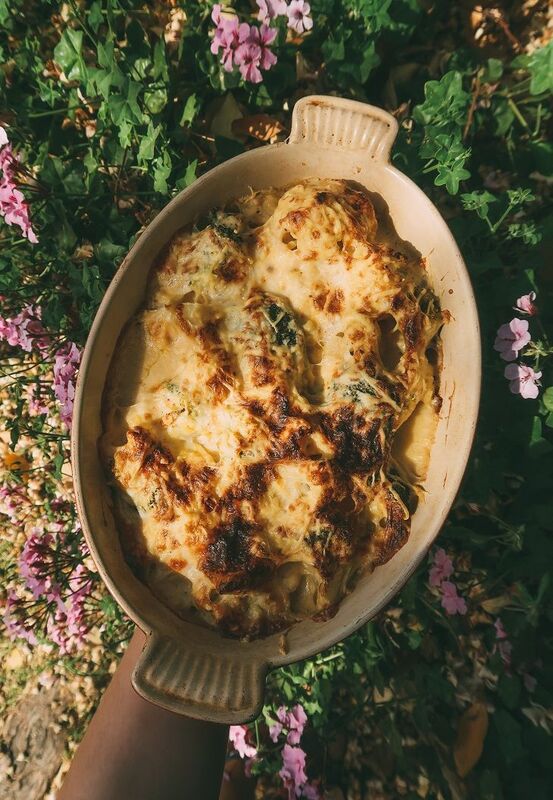 The dish follows the fabulous logic, being that if you take a vegetable, drown it in cheesiness - then BOOM, it's going to be bloomin' brilliant! I had my doubt as to whether this would be flavourful enough, but it most certainly is, plus it tastes like the real deal. I even fed it to my grandparents, to whom lentils are quite out there - and they didn't bat an eye lid despite it missing the dairy & the regular flour. Hoorah! Place your broccoli & cauliflower florets into a large pot and add a sufficient amount of boiling water, then boil them for 2-4 minutes or until only PAR-boiled. They will finish cooking in the oven. Drain & place your florets into an oven safe dish. In a medium non-stick pot, add a drizzle of olive oil and sauté the onion and garlic until soft. Add in the flour and stir for a minute or two, so the flour cooks slightly. Add the milk in small increments at first, and then in large increments until all the milk is added. A whisk works best for this process. You want to stir really well so there are minimal lumps. The GF flour will leave your white sauce a little courser then you would otherwise expect, but I promise once you put it all in the oven, everything will marry together and taste like the original. Once all the milk has been added, take off the heat and add your cheese shreds. Mix together for a minute or two (the cheese shreds will melt only slightly, don't worry they'll continue melting in the oven), then add your coconut milk, nutmeg, salt & pepper. Pour (or rather plop - don't worry if it's a little thick, it thins out in the oven, due to all the moisture in the veg) the sauce over the veg, poking it down the odd nook & cranny. Drizzle over a little olive oil and top with the handful of vegan cheese. Bake in the pre-heated oven (no need to cover it) for 20 minutes, then switch to the grill setting for 5 more minutes. Serve up my friend, so insanely good!